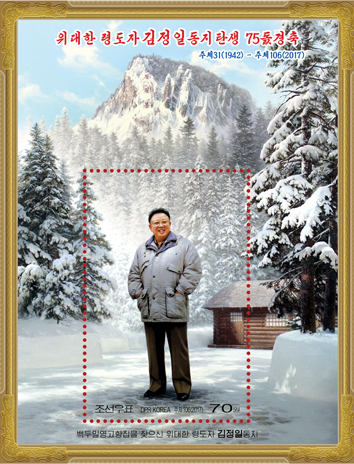 The State Stamp Bureau of the DPRK issued new stamps with the approach of the 2nd anniversary of the demise of leader Kim Jong Il (December 17). Seen on the upper parts of the stamps are letters "The great leader comrade Kim Jong Il will always be with us" and "Juche 100 (2011) - Juche 102 (2013)". 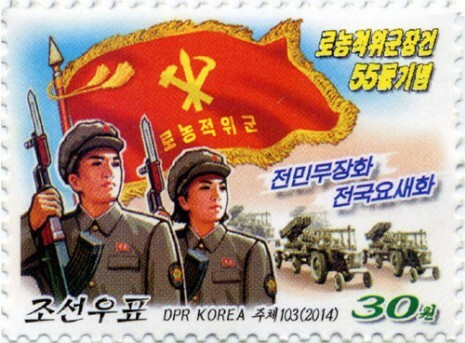 The stamps respectively feature a photo of Kim Jong Il giving guidance to a shelling drill of a unit of the Korean People's Army and a photo of him looking at vinalon cotton at the February 8 Vinalon Complex. The stamps remind people of the revolutionary life of Kim Jong Il, who devoted his all to turning the DPRK into a country powerful in ideological, political and military fields, ensuring the wellbeing of the people and achieving the prosperity of the country. The State Stamp Bureau of the DPRK issued a new stamp in commemoration of the 55th anniversary of the Worker-Peasant Red Guards (WPRG). The stamp shows members of the Guards who are replete with the will to thoroughly implement the policy of the Workers' Party of Korea (WPK) on putting all the people under arms and turning the whole country into a fortress. The WPRG, founded on January 14, Juche 48 (1959) under the guidance of President Kim Il Sung, is a voluntary military organization of working people. It serves as revolutionary armed forces of the WPK whose mission is to defend with arms the Party and the leader and the gains of the revolution from the enemies' infringement. The Bureau also brought out six stamps featuring vegetables and fruits. The State Stamp Bureau of the Democratic People's Republic of Korea issued six stamps reflecting supreme leader Kim Jong Un's New Year Address. Printed on the upper part of some stamps is "Let us raise a fierce wind of making a fresh leap forward on all fronts of building a thriving country filled with confidence in victory! ", the militant slogan for this year laid down in the Address. They deal with the main tasks facing agriculture, construction and science and technology, basic industries and all other sectors of the national economy to raise fierce flames of innovations. 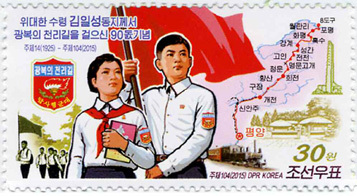 There are also stamps reflecting the tasks to make fresh strides in the construction of culture, including education, and continue to channel great efforts into building up the country's defence capabilities as well as the strong will of the army and people to consolidate the politico-ideological position of the Korean revolution and thus, cement the single-minded unity of the revolutionary ranks. With letters "Let us make fresh headway in the national reunification movement this year, true to the behests of the great leader and general!" written on its upper part, a stamp carries the ideas of the Address that call for rejecting foreign forces, holding fast to the standpoint of By Our Nation Itself, making a positive effort to defend national security and peace and establishing a favorable climate for improved relations between the north and the south. The State Stamp Bureau of the DPRK issued an individual stamp in commemoration of the 50th anniversary of the publication of the socialist rural theses. 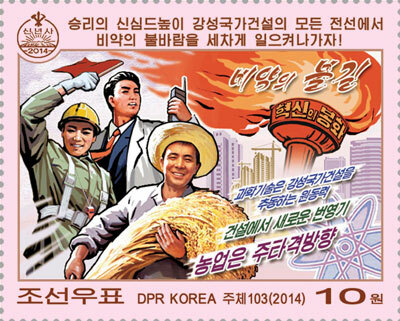 Seen in the stamp are a red ribbon bearing letters "In commemoration of the 50th anniversary of the publication of 'Theses on the Socialist Rural Question in Our Country'" and a sheaf with letters "Rice Means Socialism" in the middle of it. 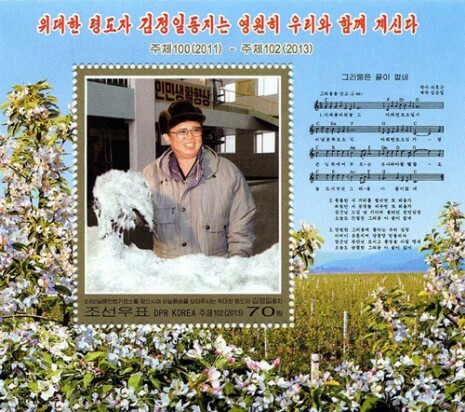 On February 25, Juche 53 (1964), President Kim Il Sung made public "Theses on the Socialist Rural Question in Our Country" to give definite answers to the peasant and agricultural questions and set forth the tasks for rural construction in the DPRK. The State Stamp Bureau of the DPRK issued new stamps (a sheet and sheetlet) in commemoration of the 50th anniversary of leader Kim Jong Il's start of work at the Central Committee of the Workers' Party of Korea (June 19, 1964). 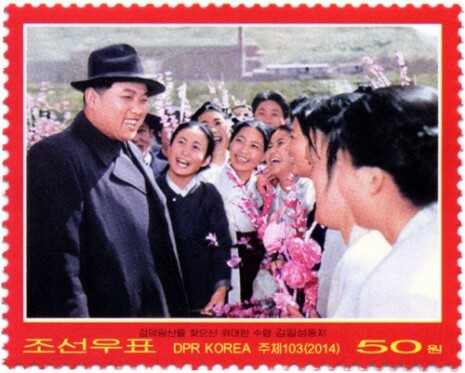 Seen in the upper part of the stamps are letters "Commemoration of the 50th anniversary of leader Kim Jong Il's Start of Work at the Central Committee of the Workers' Party of Korea (WPK)" and "Juche 53 (1964)-Juche 103 (2014)". The sheet carries an acrylic painting "Dawn breaks in the history of the WPK", which depicts Kim Jong Il starting his work at the C.C., the WPK. The sheetlet carries Korean paintings showing lofty moral traits of Kim Jong Il who had always found himself among the servicepersons and people of the DPRK to encourage them to make fresh innovations. The State Stamp Bureau of the DPRK has brought out new stamps (a sheet and an individual) to mark the 20th anniversary of President Kim Il Sung's demise. Seen in the upper part of the sheet are letters "The Great Leader Comrade Kim Il Sung Will Always Be with Us" and "Juche 83 (1994) - Juche 103 (2014)", with a photo of Kim Il Sung on a tour of field guidance to the Kangson Steel Plant. The individual one carries a photo of the President, who is among the workers of the Komdok Mine. The stamps clearly show the revolutionary life of the President, who devoted his all to the wellbeing of the people while regarding "Believing in people as in Heaven" as his motto and always finding himself among people. 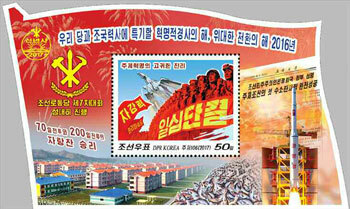 Stamps (one sheetlet and one individual) were issued in the DPRK to celebrate the Day of Songun (Aug. 25). The army and people in the DPRK significantly mark as the Day of Songun August 25, Juche 49 (1960) when leader Kim Jong Il started his Songun (army-first) revolutionary leadership with inspection of the Seoul Ryu Kyong Su Guards 105th Tank Division of the Korean People's Army (KPA). 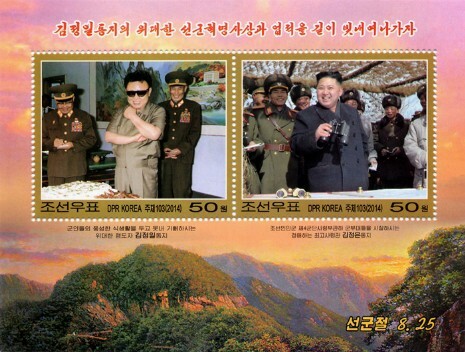 Printed in the stamps are letters reading "Let us add eternal brilliance to Comrade Kim Jong Il's great idea and achievements of the Songun revolution", "Let us remain true to the great Comrade Kim Jong Un's Songun revolutionary leadership", "Day of Songun" and "August 25". The sheetlet carries a picture of Generalissimo Kim Jong Il rejoicing at the rich diet for servicepersons and a picture of Supreme Commander Kim Jong Un inspecting units under the KPA 4th Corps Command. The individual stamp features the star of Marshal. The State Stamp Bureau of the DPRK issued a stamp (a sheet) on the occasion of the 65th anniversary of demise of anti-Japanese war hero Kim Jong Suk. Seen on the upper part of the stamp are letters "Eternal Bodyguard." Seen also in its center is an oil painting "Personally Standing Sentinel" depicting Kim Jong Suk who devotedly protected the safety of President Kim Il Sung in the whole course of her revolutionary career. The Democratic People's Republic of Korea and the Russian Federation issued two joint stamps showing two species of birds to mark the 66th opening anniversary of diplomatic relations between the two countries. 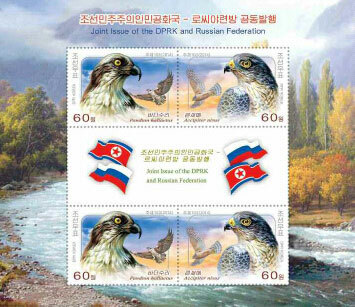 The stamps feature Accipiter nisus and Pandion haliaetus inhabiting Asia, including the DPRK, and Europe. The two countries established diplomatic ties on October 12, Juche 37 (1948) to promote the common interests and prosperity of the two peoples through the development of their friendly relations. The DPRK State Stamp Bureau issued new stamps (one individual and one sheet) to commemorate the third anniversary of demise of leader Kim Jong Il. The individual stamp carries a picture of Kim Jong Il waving back to the cheering crowd. Seen on the sheet are letters "The great leader Comrade Kim Jong Il will always be with us" and an overall view of the Kumsusan Palace of the Sun. The stamps make viewers recall the whole life of Kim Jong Il who led the Korean revolution always to victory by steadfastly inheriting the idea and leadership of President Kim Il Sung and devoted his all to prosperity of the country and happiness of the people. 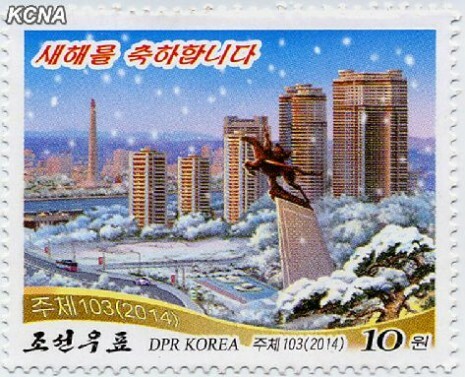 The DPRK State Stamp Bureau issued a stamp to mark Juche 104 (2015). 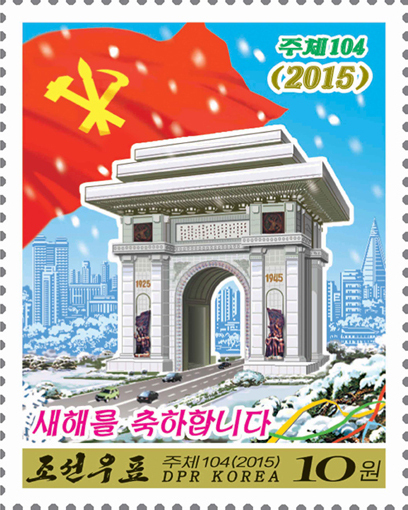 Depicted in the stamp are the flag of the Workers' Party of Korea and the Arch of Triumph against the street and edifices in Pyongyang, with letters "Juche 104 (2015)" and "A Happy New Year". The DPRK will significantly greet the 70th WPK birthday and the 70th anniversary of Korea's liberation in 2015. Four kinds of stamps reflecting supreme leader Kim Jong Un's New Year address were issued in the Democratic People's Republic of Korea. One of them displays "Let us all turn out in the general offensive to hasten final victory in the revolutionary spirit of Paektu! ", a slogan advanced in the address for this year. It also features, against the background of flag of the Workers' Party of Korea (WPK), the looks of servicepersons and civilians who have turned out in a drive to glorify this year marking the 70th anniversary of the national liberation and the 70th birthday of the WPK as a year of great auspicious events. Other stamps deal with the tasks set forth in the New Year address, which are to fully display the might of military power by effecting a new turn in building the revolutionary armed forces and bolstering up the defence capability, give a definite priority to science and technology, bring about a turn in building a socialist economic power and a highly civilized nation and open up a broad avenue to independent reunification by united efforts of the entire nation. The DPRK State Stamp Bureau issued a stamp in commemoration of the 90th anniversary of 250-mile Journey for National Liberation made by President Kim Il Sung. 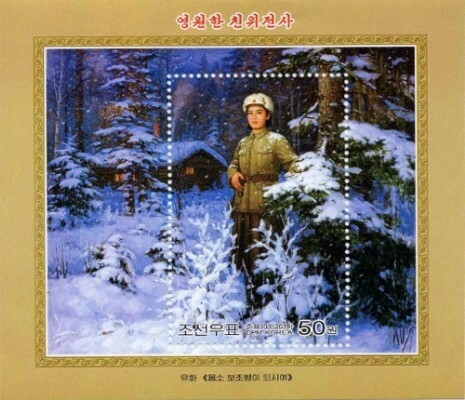 The stamp has letters reading "In commemoration of the 90th anniversary of 250-mile Journey for National Liberation made by the great leader Comrade Kim Il Sung" and "Juche 14 (1925) - Juche 104 (2015)". Depicted on it are also a map on the course of 250-mile Journey and mark of an expedition of the course and its members marching under the red flag. January 22 is the day when Kim Il Sung set out on his 250-mile journey with high ambition to liberate Korea from the Japanese imperialist aggressors 90 years ago. 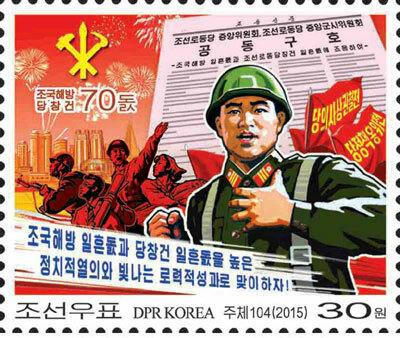 he DPRK State Stamp Bureau recently issued a new stamp encouraging the people to implement the joint slogans set forth by the Central Committee and the Central Military Commission of the Workers' Party of Korea to mark the 70th anniversaries of the liberation of the country and the founding of the WPK. Depicted in the stamp is a soldier-builder replete with the resolution to thoroughly implement the joint slogans against the background of the emblem of the WPK and banners bearing letters "Campaign for implementing the Party's ideas" and "Campaign for upholding the Party's policies". Seen on its lower part is a slogan "Let us greet the 70th anniversaries of national liberation and Party founding with high political enthusiasm and brilliant labor feats!" The stamp well shows the will of the DPRK servicepersons and civilians to significantly celebrate the country's anniversaries in hearty response to the WPK's calls. The DPRK State Stamp Bureau issued stamps (one sheet and one individual) in commemoration of the 50th anniversary of the naming of Kimilsungia. The naming was initiated by Indonesian President Sukarno in April Juche 54 (1965) when President Kim Il Sung visited his country. 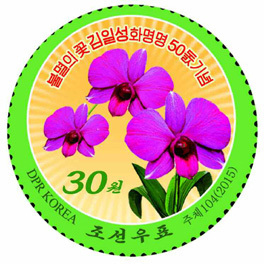 Seen on the upper part of the stamps are letters "In commemoration of 50th anniversary of naming of Kimilsungia". President Kim Il Sung who visited the Bogor Botanical Garden on April 13, 1965. It also shows immortal Kimilsungias and the garden. Depicted in the other stamp is beautiful Kimilsungia. New stamps (four sheets) reflecting the gist of the New Year Address for Juche 106 (2017) made by respected Supreme Leader Kim Jong Un were issued in the DPRK. One of them stresses that the single-hearted unity and the spirit of self-reliance and self-development are a precious truth of the Juche revolution proved through the struggle in 2016. Seen in its upper part are letters "2016, a year of revolutionary event, a year of great change, worthy of note in the history of our Party and country". It also carries letters and pictures showing the brilliant achievements made by the army and people of the DPRK under the guidance of the Workers' Party of Korea last year. The atom-shaped sheet with a slogan "Let us accelerate the victorious advance of socialism with the great spirit of self-reliance and self-development as the dynamic force!" carries a stamp calling on the electric-power, metallurgical and chemical industries to take the lead and pictures representing the tasks for respective sectors to concentrate efforts on implementing the five-year strategy for national economic development. Another sheet reflects an idea of the New Year Address to designate this year of the 85th anniversary of the founding of the Korean People's Army (KPA) as another year of training, another year of perfecting its combat preparedness and raise the fierce flames of increasing the military capability to train all officers and men of the KPA as a-match-for-a-hundred combatants, tigers of Mt Paektu, with letters "Let us further cement the political and military position of socialism as an impregnable fortress". Printed in the upper part of the other sheet are letters "Let us set up across the Party a revolutionary climate of making selfless, devoted efforts for the good of the people" with the gist of a swear made by the respected Supreme Leader to become a true servant loyal to the people and a stamp calling on officials to seek more tasks for the sake of the people. The State Stamp Bureau of the DPRK issued new stamps (one sheet and one individual) to mark the 75th birth anniversary of Chairman Kim Jong Il, the Day of the Shining Star. 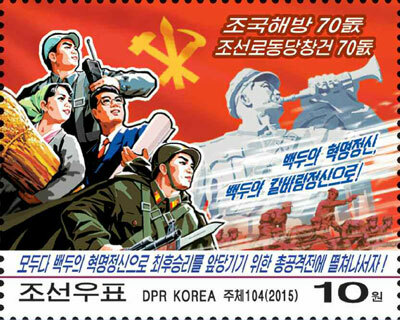 Seen on the upper part of the stamps are letters reading "In celebration of the 75th birth anniversary of the great leader Comrade Kim Jong Il". 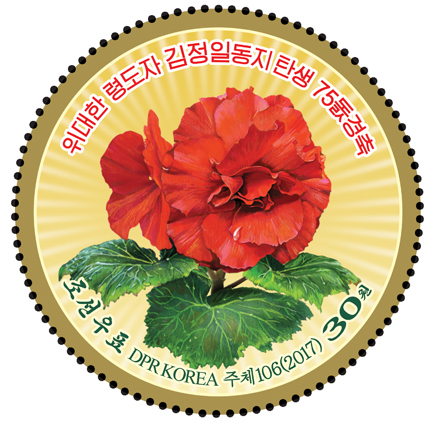 A circle-shape stamp represents Kimjongilia that has come into full bloom, reflecting deep reverence and desire of the Korean people and the world's progressives to splendidly celebrate the Day of the Shining Star as the greatest national holiday and a holiday common to the humankind.